Johan Friedrich Christian Schild was born in May of 1834 in Germany per census records and in 1862 he married Johanne Catharine Margarete Meyer while still in Germany. Johanne was born in November, 1842. Their children are: Johanne F. W. Schild, Adele Margaurite Schild, Martha Schild, Frieda Schild, Bertha Schild, Hugo Schild, Otto Schild, Friedrich W. Schild, George Schild, Clara Schild and Lina Schild. Johan and Johanne arrived in this country on May 31, 1882 on the Ship "Herman," sailing from Bremen, Germany to Baltimore, Maryland . An older daughter, Johanna F.W. Schild, arrived in America about 3 months earlier on February 27, 1882 on the ship "Neckar." As far as can be determined at this time, she sailed by herself and is listed on the ships manifest as age 16 years. Johan and Johanne Catharine arrived on February 27, 1882 but his obiturary says "they came to this country June 3, 1882 and located at Hanover where he has since resided." If this information is correct, perhaps they left Baltimore, Maryland on May 31 and arrived in Washington County, Ks on June 3, having taken the train west to Kansas. However, this is supposition and hasn't been prove out as yet. 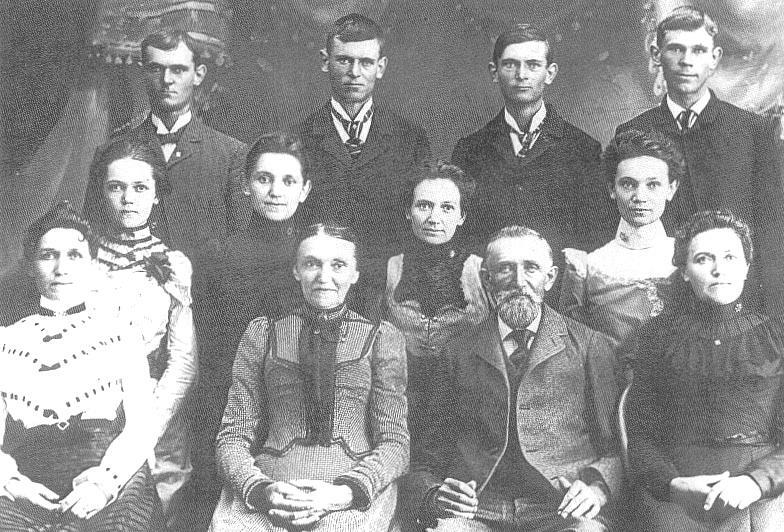 The Schild family photo taken about 1896: Front row, left to right- Bertha Marie Schild, Catherina Johane Meyer Schild, Johan Frederich Christian Schild, Johanna Fredericke Wilhelmine Schild. Middle row, left to right- Clara Schild, Adele Margarete Schild, Frieda Helene Henriette Schild, Martha Helene Wilhelmine Schild. Back row, left to right- Friedrich Wilhelm Schild, Hugo Schild, George Schild, Otto Schild. 1895 Census- Washington Co. Kansas; Independence twp; page 14:Fred Schild age 61, male, born Germany, where from to Kansas- Germany.Johanna age 53, female, born Germany; Martha age 21 female b. Ger; Fred Jr, age 18, M, b. Germany; Hugo age 17 m. b. Germany; George age 17, m, born Germany; Otto age age 14, male born Germany; Clare age 11, female, born Kansas; Herner, Ella age 6, female, born Kansas; Edith Herner age 3, female born Kansas. 1895 Agriculture Census: Fred Schild; 160acres; 100a. under cultivation, 160 acres under fence; total acres 160; 160 rods of hedge fence; 550 rods of wire fence; value of farm $3500; falue of implements $10; 80 acres planted to corn; 20 acres planted to oats; 1 acres planted to irish potatoes; 22 acres of prairie in fence used for meadow. Owns 3 horses, 4 milch cows, 1 other cattle, 3 swine, 1 dog. 1900 Census Washington Co. Independence twp V.54, E.D. 138, sheet 2: Fred Schild born May 1834, age 66 married 38 years, born Germany, immigrated to America 1882, in the U.S. for 18 years, Naturalized, rented farm; Hannah, wife born Nove 1842, age 57, married 38 years, mother of 13 children and 10 are living; born Germany, to America 1882; Otto, son, born Jan 1881, age 19 born Germany: Clara, daughter, born Dec 1883 age 7, born Kansas; Ella Kerner, granddaughter, born Nov 1888, age 11 born Missouri; Ida Kerner, granddaughter, born December 1891, age 8, born Missouri. 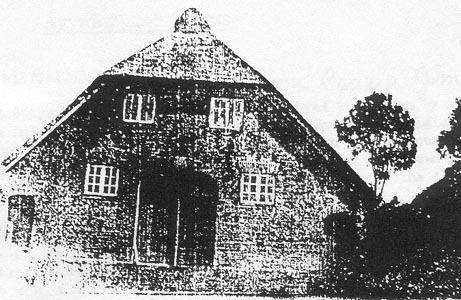 The picture shown above was taken about 1883 or 1884 at the Schild family homestead in Oldenburg, Germany. Family stories say the Schild's lived in a house that was attached to the barn so this could be their house. Most houses of that era and to this present day were attached to the barns and kept as clean as the barn. Came to America on the Ship- Herman- from Bremen to Baltimore and arrived on May 31, 1882. Johann Schild age 48, M, farmer, from Germany; Catherina age 39, Bertha age 15, Lina age 13, Frederich age 11, Adiele age 10, Martha age 8, Frieda age 5, Hugo age 4, Heinrich age 4, Otto age 10 months. Listed in Germans to America. First Naturalization Paper: United States of America, State of Kansas, Washington County: Before the Clerk of the District Court of the Twelfth Judicial District of said State, personally appeared Johann Fredrick Christian Schild a native of Germany aged about 55 years, who being duly sworn, upon his oath, declares that it is bona fide his intention to become a citizen of the United States of North America, and to renounce and abjure, forever, all allegiance and fidelity to every forein power, Prince, Potentate, State and Sovereignty whatever, and particularly to the Emperor of Germany of whom he was heretofore a subject. Sworn to and subscribed before me, this 26 day of February, A.D. 1890. Final Naturalization Paper dated. March 18, 1895. Register of Deaths, Washington Co., Kansas: F.C. Schild, age 78, male, white, widow, old age is cause of death, nativity foreign, place of death is Lanham, date of death is 5-30-07, return made by d. Michelson. Register of Deaths, Washington Co. Ks: January 6, 1903- Johana Shields, age 60, female, white, married; cause of death- Dropsy. Died in Hanover. Obituary, Hanover Herald, January 9, 1903: "Mrs. Johana Schild, aged 60 years, 2 months and 4 days, died at her residence, 1 3/4 miles west of Gerardy, Tuesday, January 6, 1903. Ther funeral will be held today at the Hanover Ev. Lutheran church, at 11:30 conducted by Rev. Karl Klinger. Deceased leaves a husband and several children to mourn the loss of a loving wife and mother. Ther Herald joins the friends of the family in extending sympathy." Also in the Herald on the same page was the following under the news of Independence: " Mrs. F. Schild, who has been sick the past four months, died Monday night." Obituary: Johan Friedrich Christian Schild; Hanover Democrat, June 7, 1907: Again we are called upon to chronicle the death of one of our pioneer citizens, Mr. Johan Friedrich Christian Schild. He was born at Oldenberg, Germany May 17th. 1834 and died at Hanover Kansas May 30th, 1907, aged 73 years 13 days. Mr. Schild came to this country June 3, 1882 and located at Hanover where he has since resided. His wife died some three or four years ago. Mr. Schild has never been well since that affliction and has only lingered awaiting the final summons to meet those loved ones who had gone before. He leaves ten children, the loss of a kind and doting father, namely: Mrs. J. S. Swan, St. Joseph; Mrs. Au. Thiele of this city, Mrs. Jno. Boettcher, Diller Nebr. ; Mrs. Wm. Boettcher, Bremen, Kans. ; Mrs. Herman Wulff, Gerardy Kansas. ; and Miss Clara, Hugo and George of Manhattan Kansas and Fred and Otto of Hanover together with eightenn grandchildren. He was buried from the Lutheran church of Hanover on Sunday June 2nd. 1907. The bereaved children have the sympathy of the entire community in this their sad bereavement.